Fish recipes like this one are well worth the wait. Perfect for a special soiree for two, this elegant dinner can easily be prepared at the end of a busy day, Pan-searing the salmon seals in the juices, leaving the fish succulent and moist. This dish is best in the summer, when fresh tomatoes are at their peak; otherwise, use Roma tomatoes or quartered cherry tomatoes. 1 Combine the tomatoes, basil, garlic, vinegar, ½ teaspoon of the salt, and 1/8 teaspoon of the pepper in a small bowl. 2 Sprinkle the salmon with the cumin and the remaining ¼ teaspoon salt and 1/8 teaspoon pepper. Heat the oil in a nonstick skillet over medium-high heat. Add the salmon, skin-side up, and cook 4 minutes. Turn the salmon and cook 1 minute longer. Cover the pan, reduce heat to medium, and cook until the salmon is just opaque in the center and flakes easily, 2-3 minutes. 3 Transfer the salmon to serving plates and add the tomato mixture to the skillet. Increase the heat to high and cook until the mixture is warmed through, 1-2 minutes. Spoon the relish over the salmon. Avoid eating the salmon skin. 4 Steamed white and wild rice, or orzo pasta, lightly drizzled with extra-virgin olive oil and cracked black pepper, makes a fitting accompaniment for this elegant dish. This fine old New Orleans dish never tasted so good-or was ever quite so low in fat. Serve with 1 cup cooked rice per portion. It’s a great entree for company because you can double it and make it in advance. (Don’t stir in the shrimp until after reheating, or it will toughen.) On the side, I like okra or greens. 1. In a large no-stick skillet over medium-high heat, bring the stock to a boil. Reduce the heat to medium. Add the onions, peppers, celery, and garlic. Cook for 3 minutes, or until the onions begin to turn translucent. 2. Add the tomatoes (with juice), tomato sauce, Worcestershire sauce, thyme, oregano, bay leaf, and 1 teaspoon of the hot-pepper sauce. Bring to a boil. Reduce the heat to medium-low and sinner, stirring occasionally, for 20 minutes. 3. Place the cornstarch in a cup. Add the water and stir to dissolve the cornstarch. Add to the skillet. Stir for 1 to 2 minutes, or until the sauce thickens slightly. 4. Add the shrimp; cook for 2 to 3 minutes, or until pink. Taste and add the remaining 1 teaspoon hot pepper sauce if needed. Creole is the city cousin of rustic Cajun cooking. Historically, it is a vivid blend of French, Spanish, and African, with a smidgen of Italian, Hispanic, and Native American. Seafood and luxurious sauces have traditionally been emphasized. Both cuisines rely on the “holy trinity” of chopped green peppers, onions, and celery. I was fortunate enough to attend this supper for seventy people. Four Salmon were used, and it took 4 hours to cook. The fire was lit 9:00 o’clock in the morning. The bed of coals were being made from 9:00 to 1:00, as the fire burnt in a 45 gal. drum cut down. We used maple on our fire but you can use any hard wood available with the exception of birch. They claim the raisin from the birch bark will give the salmon a bad taste. It would be a good idea not to use wooden pallets because they may be contaminated by what they carried in the past. The salmon was prepared by removing the head, tail and fins then halved down the middle. The back bone is left in until the fish is cooked, and than removed before serving. That way a lot of the bones are removed at the same time. The salmon is placed on the maple planks skin side to the board. The fish is out lined with small nails, and than rapping sneer wire cress cross back and fourth across the fish. 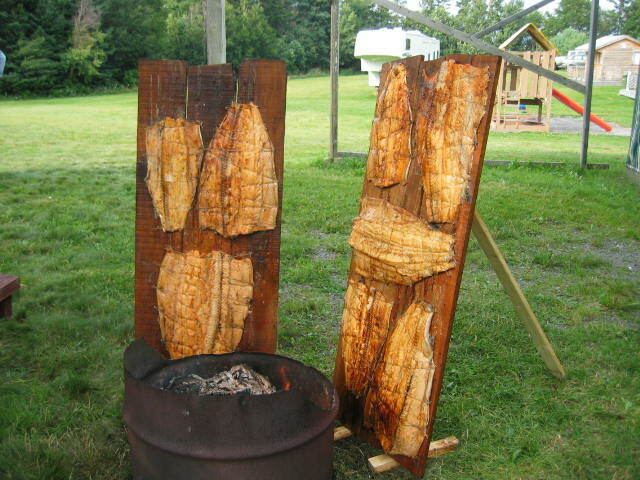 The planks of fish are than placed down wind from the fire, standing up close to the coals. The planks are turned end for end each time the fish is basted every 20 minutes. Using a 2-inch brush and basting the fish with melted butter and seasoned to your liking with garlic and any other spice you prefer. Approximately 40 lbs. of salmon were done to feed 71 people (about ½ lbs. piece of fish each). The fish cooked from 1:00 o’clock until 5:00. Fish recipes like this one are well worth the wait. I think this is one we might be doing as a annual event. We hope to find more fish recipes from around the country, maybe we might find one you might like. Learn how to cook traditional French food in the comfort of your own kitchen and savor the food of France. A list of traditional French food fish recipes from all around France. Regional specialties, using famous foods to create well known dishes from France.